There is no city quite like New York City, and no hotel quite like New York Marriott Marquis. Set in the heart of Times Square on West 46th Street and Broadway, our iconic Manhattan hotel lets you experience all the magic of NYC from the moment you arrive. Feel the energy all around you, both within the hotel and as soon as you step outside. Inside our towering hotel, you'll find some of New York City's largest hotel rooms and suites and multiple restaurants, including the only revolving restaurant in the city and a popular outdoor lounge. Event planners have more than 120,000 square feet of versatile meeting and event space to work with and an expert staff ready to help you design an anything-but-ordinary event. And our knowledgeable staff is always ready to help hotel guests navigate this expansive and ever-changing city. 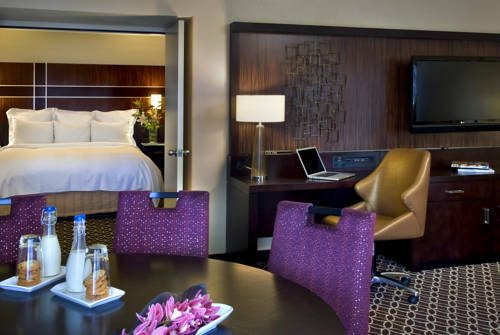 Whether visiting for a family vacation, a Broadway show weekend or attending a conference, New York Marriott Marquis is truly the perfect hotel for your stay in New York City. The View Restaurant & Lounge: Experience New York City's only revolving restaurant and lounge, where the view is complemented by the irresistible cuisine. Choose our prix-fixe dinner, or join us for Sunday Brunch. Our comfortable lounge is also perfect for pre-theater drinks. Broadway Lounge & Terrace: Relax on the outdoor terrace overlooking Broadway for drinks and small plates. Inside the lounge, comfortable seating areas invite you to sit back and enjoy pre- or post-theatre fare or catch a game on one of the large-screen TVs. Crossroads American Kitchen & Bar: Start your day in New York City with a delicious breakfast from our extensive buffet, featuring classic American favorites. Meet with colleagues over lunch, or enjoy dinner and drinks before heading out for a night in the city. Starbucks : Get your usual morning cup of "Joe" to go, or take a few minutes to enjoy it in our Times Square caf , along with the coffee house's well-known pastries, breakfast foods and more. Fresh Bites: In-Room or On-the-Go: Enjoy fresh, authentic, locally sourced food without the fuss. All orders include eco-friendly utensils, napkins, and cups; everything you need to enjoy in your room or on-the-go in New York City. Call Fresh Bites from your room to place your order.